Leiva’s Jewelry produces many of the fine pieces we sell on location, at the hands of master jeweler Transito Leiva. Leiva’s own amazing designs of rings, necklaces, earrings and pendants are crafted primarily using gold and silver. Gems found at the store include sapphires, pearls, rubies, emeralds and diamonds. We also feature select jewelry by Colore, Design by Yagi, Reactor and G-Shock watches, and engagement ring settings by various New York distributors. If you have a design in mind and would like a piece custom-made, simply bring in a photo or describe your dream creation. Transito can complete most pieces in two weeks’ time. 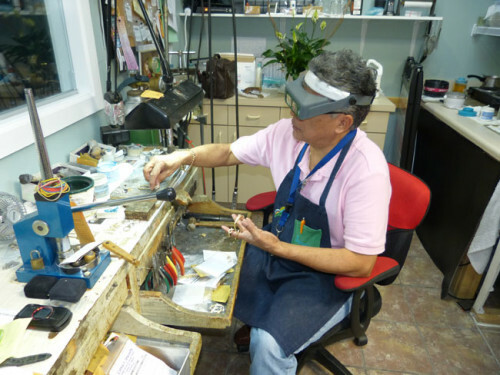 Leiva’s Jewelry does repairs on jewelry & watches, and can also install new watch batteries. Most repairs have a 24-hour turnaround. If your Rolex watch needs to be repaired, Leiva’s will take care of sending it to an authorized Rolex jeweler, ensuring the use of only Rolex parts.